Jewellery is a dangerous art form. Of all the mediums of creative expression, it is most commonly associated with the wealthy elite, the one percent. Open a flight magazine and you will find pages of seductive advertisements for diamonds to adorn the executive and partner. The noble mission of art jewellery is in part to transcend its destiny as a currency of power. How can it do this? The modernist path is to develop the purely aesthetic nature of jewellery. According to art jewellery lore, it all began in the ruins of World World Two, with Professor Hermann Jünger in Munich, who found a way to express the painterly quality of gold. Next, other Germans soon began to realise the beauty that resided in less precious materials like silver, then copper and aluminium, perspex, glass, tin and so on until it arrived in the Antipodes, where they made precious adornment out of street rubbish. This critique of preciousness positioned artistic expression as the alternative to crude economic wealth. But there is another path, which looks back rather than forward. Traditionally, jewellery also had a set of symbolic functions. An amulet protected the wearer from evil. A charm bracelet promised good fortune in life. The crown bestowed sovereignty. A few such functions remain, such as the wedding ring as a symbol of matrimony. But these capacities have largely disappeared, along with other trappings of a superstitious pre-modern world, such as the evil eye and sympathetic magic. Freedom is the ideological framework for our age. It is the political mantra of our governments, not only to protect our liberties against terrorism, but also to free up markets by loosening restrictions such as tariffs. As individuals, we are surrounded by products that solicit this freedom. The “no contract” deals for our telecommunications give us the freedom to access content 24/7, without any long-term obligations. Netflix “allows users the freedom to watch shows at their own pace”. But freedom cuts both ways — for us, and against us. Compared to the previous generation, our working lives are less secure. The growing casualisation of the workforce grants management ever greater freedom to hire and fire. The dominant platforms for micropreneurs, like Uber, offer no employment security whatsoever. The decreasing value of promises is evident in a wide range of issues. Clearly election promises are treated with cynicism by most voters (which led UK Labour to carve its promises on stone as a way of demonstrating sincerity). The increasing control over our lives and goods by the Big entities — Big Data, Big Pharma, Big Banks, etc. — leads to a world that cannot be trusted. This is evident where it really counts — the future of the planet. The verbal commitments made recently in Paris to address climate change are seen as “mere promises”. The loss of trust in the public sphere is largely self-evident today. Less obvious is the impact this liberalisation has in our personal lives. Social communication is riveted with promises. “I’ll give you a call.” “OK, I’ll get that done tomorrow.” “The next coffee is on me.” Our ability to keep those promises is a core component of our social being. The promise is a key feature of secular literature as well. We are still familiar with the tropes of melodrama that revolve around a vow. The hero is ultimately a person of honour, who always keeps their promise even at great cost to themselves. By contrast, the villain is the antithesis, who betrays others and reneges on his or her promise. Part of the appeal of Game of Thrones is the spectacle of this traditional world colliding with the neoliberal realities of violence. As a pre-Facebook world, it’s narrative threads are constructed through promise objects. 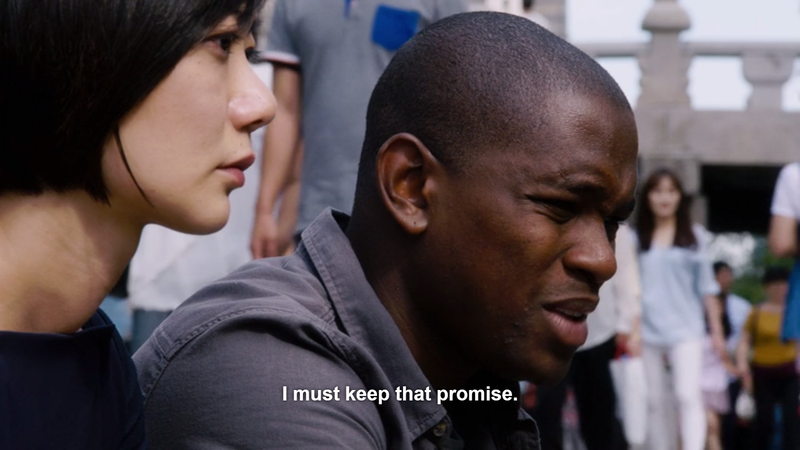 In this light, it’s particularly interesting to look at the new series by the Wachowski siblings, Sense8. Like their classic Matrix, this team superhero drama presents a world where normality is a fiction: characters discover hidden selves that possess an uncanny awareness of the total picture. But today, these characters have the capacity to communicate empathically with each other, reflecting the constant connectivity we have taken for granted through messaging platforms like WhatsApp. The series dwells on their capacity of co-presence while at opposite ends of the world. The plot is driven by a conflict between two forces. On the one hand, characters seek the freedom to be who they really are, particularly within an LGTBI framework. But on the other hand, they are bound by promises they have made earlier in their lives, mostly to their mothers. The South Korean businesswoman who defies patriarchy by winning a kick-boxing competition grapples with the promise made to a dying mother that she look after her brother. Within a contemporary setting, which heightens expectations of freedom, acts of commitment are still necessary to provide a trajectory in life. The counter-balance of commitment has declined in recent times. Membership of political parties is declining, partly replaced by the untethered practice of clicktivism. Trust between neighbours is decreasing. The usual response to this decline is an increase in surveillance. There are more CCTV cameras in the streets, more cybersecurity programs and higher profile border protection. While cuts continue to government public services, the cost of security clearances increases exponentially. But rather than treating the symptoms, are there ways of preventing the disease? When all else seems lost, we return to Gandhi’s dictum, “be the change”. One of the most important promises is the one we make to ourselves. In secular culture, the annual day of promise is the first of January. This is the day in which we reflect on our lives and make a promise to improve ourselves. Are you serious? Today, the New Year Resolution has become a subject of comedy. Compare this to Japan. A group of jewellers from eleven different countries recently got together to share their cultures’ approach to promises. Naoko Inuzuka described about how resolutions are made during the New Year’s lunch, which is the most important family gathering of the year. Every family member makes a ho-fu or vow, which means “’holding and carrying (something by the self, for the self)”. These wishes are then written on wooden plaques purchased from temples and shrines. It is said, “’Decisions made on New Year’s Day are the key to a successful year”. In the West, New Years Resolutions are largely subjective acts, with no ritual to bind them. While we all can’t become Japanese, it’s possible that we can take lessons from their culture that we can apply to the way we design our worlds. As Gaudi said, “Originality consists in returning to the origin.” What can we learn from the world’s traditions about sustaining a community? Jewellers are creators of objects whose enduring value is to connect individual wearers to shared meanings. Our brooch is a potential conversation piece that can bring private beliefs to the surface. The Melbourne jeweller Roseanne Bartley knew this well when she developed a series of tags with charged words like “queue jumper” to trigger discussions with strangers about hot issues. Since the AIDS ribbon was developed in 1991, we have looked to express commitment to issues through some form of body adornment. While the feelings already existed, they needed an object around which to gather. Beyond its public nature, the materiality of jewellery also contains a mnemonic power. The object is in daily communication with our body through physical contact. This precious thing is included in our sphere of care, along with the other objects — wallet, phone, keys — that we monitor to ensure all is accounted for. Did we leave it in the hotel room? This physicality helps underpin the otherwise abstract commitment made in words. So what kind of objects might we design today that will help re-build the trust necessary for positive change? What things can help us make a personal commitment to follow what we believe — to be tolerant, to care for the environment, to honour the memory of a departed relative? What tokens can we offer others as a guarantee of our commitment to a certain course of action? What objects can we wear that demonstrate a shared solidarity for a particular cause, as expressed in specific behaviours, such as buying locally made products? As the language of preciousness, jewellery makes manifest what we consider to be valuable in the world. Creative freedom through art has been one of the main alternatives to the economic value otherwise expressed in diamonds and gold. But it isn’t the only path. We shouldn’t neglect the social value that distinguishes most traditional practices of body ornament. The big issues of our time demand binding commitments. It is time to refashion the tools for making pledges. Let’s learn from our ancestors. Promises weren’t just made to be spoken. Edits Garland magazine and is Senior Vice-President of World Crafts Council - Asia Pacific.